Racing at a snail's pace is due to take place at an appropriately named Cambridgeshire village. 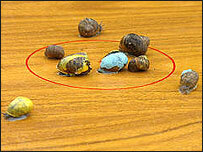 The seventh biennial Grand Championship Snail Race is to be held in Snailwell, near Newmarket, on Saturday. Organisers at St Peter's Church said the racing sees up to 400 people flock to the summer fete in the village, which has a population of 180. Entrants pay £5 to back a painted snail with the first to crawl over the finish line earning a snail-shaped award. The snail race was developed as part of the village's annual summer fete as a way to catch people's attention 15 years ago, and organiser Maureen Howes, a church warden, said the "weird and wonderful" idea has been a hit. Ms Howes, in charge of the competitors' brightly coloured strips, told BBC News: "I just paint the back of the snails, with acrylic paint. "Thrushes won't pick them up afterwards so they live a long time - so it's saving the snails." The race takes place on a wooden track with a painted circle, with snails placed in the centre of a 14in (36cm) diameter circle, - the first mollusc to dash across the line, wins the heat. "It doesn't take long - some go off fast, but they can do an about turn just before the line," Ms Howes said. "The champion gets a crystal snail on a plinth and a bottle of sparkling wine."